Carved in stone. 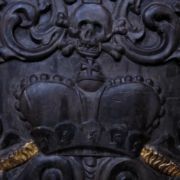 Details from the Frankfurter Cathedral. 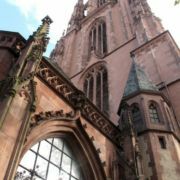 On our last day in Germany, a beautiful sun laden fall day, we went to the city of Frankfurt… Our first visit: The “Dom.” Build out of red sand stone the Frankfurt Cathedral was constructed in the 14th and 15th centuries on the foundation of an earlier church. Gothic. Haunting. Humbling.